Are you ready to communicate online? In the “olden days” of the Internet all you could do was send an email. Even then it was just plain text and you couldn’t have a memorable email address because it was something like “73456,92@compuserve.com”. Oh how modern we thought we all were….! Nowadays, of course, you can have an unlimited array of memorable email addresses, as well as receive messages on SMS, via Twitter, on Facebook, at LinkedIn, or even get a video email or perhaps a Skype call…and so on and so on. Never before have we had so many choices as to the way we can communicate. This week I was told of a leading international airline which had its induction day for its new graduate recruits. They were given their uniforms, their shiny laptops and their logins to the intranet. They were also given their individual email addresses. But the HR manager handing out the email addresses was asked by one British graduate “what is email for?” It turns out that this young man had never sent an email in his life. He didn’t need to – there are so many other ways he can communicate. 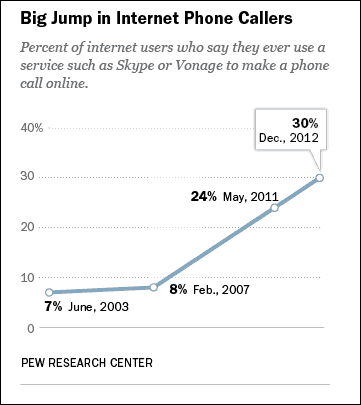 New information from the Pew Internet research centre shows that as many as 42% of people under the age of 29 now make Skype or Voice Over Internet Protocol (VoIP) calls regularly. For them the telephone is old-fashioned. So how well prepared is your business? If you are not using VoIP or Skype you could be missing out on the preferred calling method of many of your potential customers. Equally, if you are using email, but not instant messaging you are also eliminating a sector of your audience. Email is still significant, so too are phone calls as are messages on social networks. But no longer can you avoid communicating in a multiplicity of ways. If you stick with email and phone you really are stuck in those “olden days”. More confusion for Internet users thanks to Microsoft Teams Microsoft Teams is the latest messaging apps to hit the Internet. How many more do we need? The more choice, the more "paralysis" sets in. Who is the Internet Generation?